Best Rated Octane Fitness Home Elliptical Machines * Comparison & Reviews 2019: This is a roundup, comparison and reviews of the best rated Octane Fitness elliptical trainers. Octane fitness not only makes Ellipticals for the home, but also makes commercial gym quality models. These are high end models. Ellipticals are either standing or recumbent. People with disabilities or mobility problems prefer the recumbent type of elliptical. You will see the higher end models in rehab facilities. Those ellipticals with arms are called cross trainers, as they can build your upper body as well. Octane fitness is unique in that they also provide 3 Workout Boosters, to truly give you a cross training experience. Elliptical Cross Trainers provide an excellent form of aerobic exercise at home that you can do no matter what the weather is outside. Elliptical machines are easier on your joints than other forms of cardio exercise. These low-impact exercise machines also build arm and leg strength. You can compare each Octane Fitness elliptical trainer below by features such as workout programs, reviews, maximum weight capacity, price, and other features. A glossary of terms is available at the bottom of this page. Octane’s 3 Workout Boosters = Unique to Octane Fitness are 3 workout boosters. Examples are s X-Mode, Glute Kicker, or Arm Blaster. These target specific body areas for a great cross training workout. Bluetooth® with APP = The Octane xR6xi Elliptical has built-in Bluetooth® and an APP that works in your smartphone or tablet. This gives you more functionality, and an additional 43 workout programs in addition to the 9 that are built-in to the console. Telemetry Belt/Telemetric Transmitter = This is a belt that is worn to wirelessly monitor your heartrate. This can be used instead of the grip type of heart monitor and is considered more accurate. Polar is a popular brand. Self Powered = Self powered means, you do not need an electrical plug, and all the electricity for the machine and display is generated by your motions on the machine. 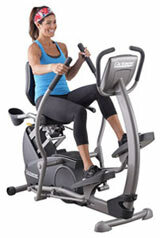 Octane Self powered elliptical machines are the commercial grade models.